Somehow it takes a few days for my eyes to adjust to being in Paris before I begin to see artful graffiti almost everywhere I turn. Maybe it's because all my powers of perception are (trying) to focus on navigation. So far, I haven't gotten lost since arrival about 10 days ago, if I don't count getting on the Metro going the wrong direction, a error quickly remedied. Didn't even have to leave the Chateau d'Eau station to turn myself around. Here are a few examples of street art from the last two or three days. Having given up on getting up in the dark for dawn photo shoots, I have discovered a good alternative in photographing at night. 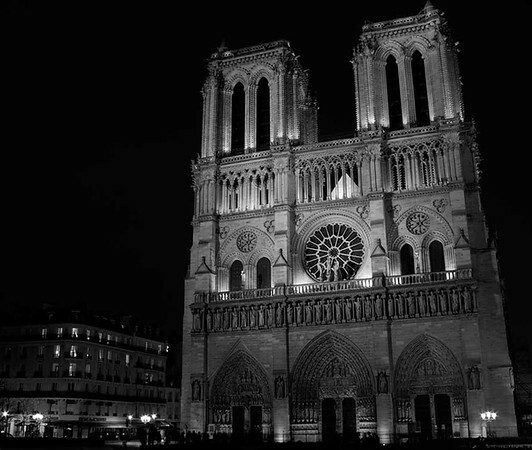 Paris is like an enormous studio, each monument with built-in accent lighting. Just one of last night's shots is featured on the photoblog.